Mix the ingredients for the pakoras to form a batter. The consistency should be that of bajjis, not too loose. Deep fry the pakoras in hot oil using deep frying pan /Kadai. Kept aside. Beat the curd well. Add gramflour and other ingredients and beat well. Heat oil and add the jeera and halved red chilly. When the jeera splutters and turns brown, lower heat to minimum and add the curd mixture. Stirr continuosly After 3 mins, remove from fire. 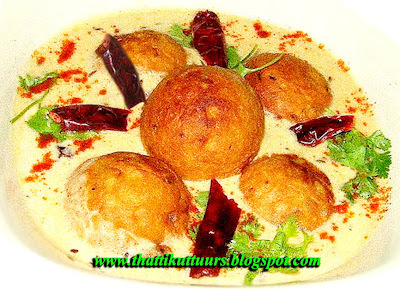 When you are ready to serve the kadhi, add the dumplings, mix once through and serve. Garnish with chopped coriander leaves and green chillies. Sserve with chapatis / roti.